RIO AMAZON Cat`s Claw Teabags can be used to contribute to the immune system and may help to maintain flexible joints. Contains Cinnamon, Ginger, Cardamon and Orange Peel giving the tea a pleasant, warming taste. 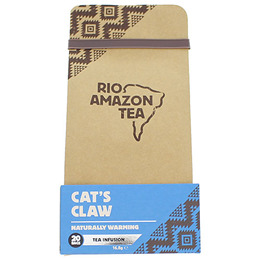 Rio Amazon teas are made from high quality botanicals in unbleached teabags. Antioxidant rich and contains no additives. Shredded Cat’s Claw bark (Uncaria tomentosa) (43%), Orange fruit (31%), Cinnamon (12%), Cardamon (7%), Ginger (7%). Infuse 1 teabag in a cup of boiling water for 3-5 minutes. Drink and enjoy! Below are reviews of RIO AMAZON Cat`s Claw - 20 Teabags by bodykind customers. If you have tried this product we'd love to hear what you think so please leave a review. Great for boosting the immune system and a really nice, cinnamon-type taste. One in the morning and one in the evening keeps the bugs at bay.